The world seems ready for a reboot of Murphy Brown. With the success of reboots like Roseanne, Will & Grace and Queer Eye, now seems like the perfect time to re-introduce the cast of crew of FYI, the fictional television news program Murphy once worked on. 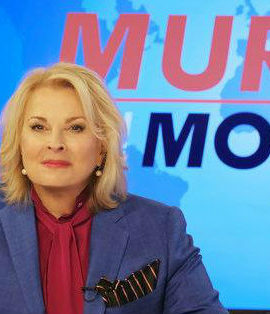 The long-running CBS comedy Murphy Brown was one of the sharpest and more daring shows of its time (the program aired from 1988 to 1998) so it seems like a master stroke to bring it back now when millions of Americans are following the news more closely than ever before. With that in mind, it’s hard to not be disappointed in this reboot, which oftentimes settles for the simplistic jokes about politicians rather than taking on the trickier political subjects of the day. The great Candice Bergen returns as the title character. Although FYI is off the air, Brown longs to return to the airwaves to offer her take on the Trump administration and the latest political news. In the first episode of the new season, she’s offered that chance and returns to the airwaves on Murphy in the Morning, a panel-driven show where she’s joined by her former colleagues Corky Sherwood (Faith Ford) and Frank Fontana (Joe Regalbuto). Also returning is producer Miles Silverberg (Grant Shaud), the program’s oft-distressed executive producer. In the pilot episode, Murphy’s son Avery (Jake McDorman)– a political journalist himself– returns home to launch his own morning show on the conservative-leaning Wolf network. Murphy will be competing with her own son in the ratings. The show’s first episode (entitled Fake News) finds Murphy returning to the air. It’s in that premiere episode of Murphy in the Mornings that the rebooted Murphy Brown really finds its voice. From Corky getting hot flashes while talking about global warming to an environmental protection agency employee falling through the ice, the show finds great humor in putting these hilarious characters back on the air. It’s unfortunate then that when the crew is off the air, the show oftentimes settles for superficial set-ups and one-liners. In the second episode, for instance, Murphy crashes a White House press briefing to question the press secretary’s veracity. This set-up could’ve provided great fodder for laughs but instead, the show simply hammers its point of view without adding anything fresh or funny to the proceedings. As a long-term fan of this CBS sitcom, it’s disappointing to see that the show settles for easy laughs but there’s an undeniably great foundation here for it to improve. Setting up Avery as a ratings rival for Murphy was a great idea and hopefully it builds to some interesting storylines about Murphy’s relationship with his conservative-leaning network. It’s great to have Murphy Brown back on the air but the show is missing the politically-incorrect edginess it once had. With an upcoming storyline about the Me Too movement, one hopes that this comedy won’t miss its opportunity to add its smart unique voice into the national conversation. In the first few episodes, however, it’s been disappointing to see how tame the show has been.